Not only a neat response - but what an amazing thing to be buried there in a pyramid. Wow, that's amazing. What an eccentric idea - not only the idea of a white pyramid, but the splendid and ostentatious isolation of it. What an interesting response to the prompt, and it is a memorial to a highly interesting man. Is a spectacular view a must after you die? I suppose the view is for the visitors but still, it's a funny concept, especially since the dead rarely have windows. They do always seem to make much of the view from a hillside tomb, don't they? But I think it's mostly for hikers who go up there -- it's a good walk through the park -- and does offer a nice view on clear days. 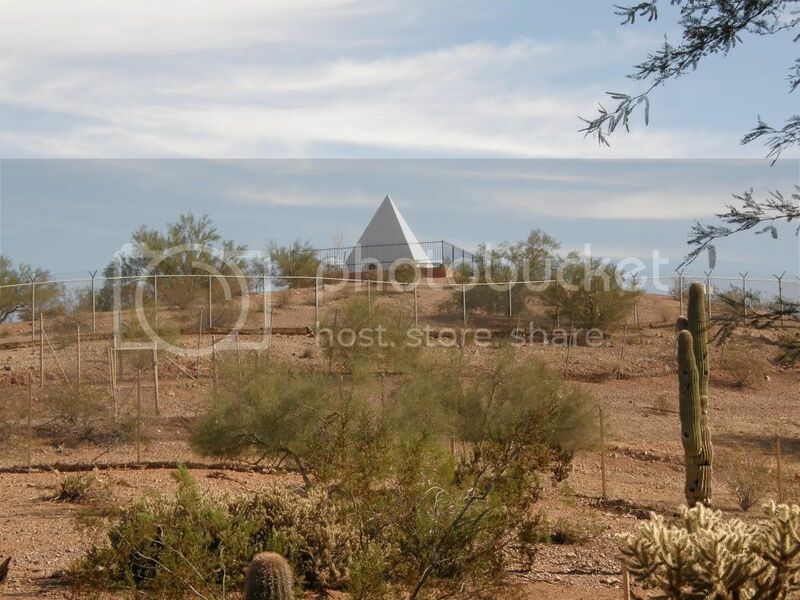 Usually I see it from this angle, which is from the Phoenix Zoo; I've never taken the trail up there, so I can't really speak for the views FROM the tomb!